I am not the voice that says "I". I am not these feelings. I am not these thoughts. None of this is mine. The idea of a happiness (or OKness) independent of conditions is not entirely without merit. But talking about it is confusing. It's possible to access a lens from which the question of happiness is a non-issue. But unless we insist that all other lenses are invalid, we'd have to admit that access to the lens in question is impermanent and dependent on conditions. Other than the jaw-dropping genius and elegant simplicity of Descartes' thought, what jumps out while reading his work in the original language is how much the French of 1637 looks like the French of our own time. Compare this to the changes in English over the same period. Shakespeare's King Lear, for example, was written in 1606, and the 400 intervening years have seen the language change so much that it's barely recognizable to us as English. The consistency of the French language over this same time is due to the efforts of the Académie française (French Academy), first established in 1635 for the very purpose of standardizing and purifying the French tongue. I must say, they have done a remarkable job, since Discours de la méthode, judging by the language alone, looks like it could have been written yesterday. This is the fifth book in a five-book series of detective stories for German language learners. I've read the first four, and I'm bummed that there aren't any more after this one. So much fun. This one starts when a human ear is found in a can of dogfood. Heidi is the dog that finds it, and the title translates into English as "Heidi's Breakfast." Last Edit: 02 Nov 2015 16:17 by Kenneth Folk. I'm reading a detective novel in German on the ebook reader on my tablet. But I'm new to German. How to start? „In anderen Worten, jemand hat Wertensen Betäubt, sein Ohr abgeschnitten und in den Baggersee geworfen“, fragte Katharina. "In other words, someone drugged Wertensen, cut off his ear, and then threw him in the quarry pond?" asked Catherine. This is already a language learner's dream. But it gets better. If I set the translator to "German to German," it shows me the original German text. But it also offers a little speaker icon. If I tap on it, it will say the passage aloud in surprisingly natural sounding German. "En otras palabras, alguien ha drogado Wertensen, cortó oreja y lanzado en el lago", le preguntó a Catherine. This translation is not perfect, but pretty darn close, and easily close enough to get the sense of what's going on. « En d'autres termes, une personne a drogué Wertensen, coupé son oreille et jeté dans le lac », a demandé à Catherine. I do the same for Portuguese, Italian, and Russian. There are nine other languages available on the translator including Chinese, Japanese, and Hindi along with several European languages, but I'm not studying them yet. I believe this ability to listen to a new language being pronounced while you are learning to read it is hugely important because we will always hear something inside our heads as we are learning to read, and if we get in the habit of subvocalizing the words wrong (usually attempting to use the sounds of our native language), we will be unable to speak or understand native speakers should we ever decide to learn those skills in the future. And even though my interest is by far tilted towards reading rather than speaking or listening or writing second languages, I still need to hear it as I'm reading in order to get the feel of it. Some of the languages I'm interested in, e.g., Latin, Pali, Romanian, and Sanskrit, aren't yet available on my ebook reader translator, but I won't be surprised if they show up soon. Meanwhile, it's already an embarrassment of riches. Last Edit: 03 Nov 2015 18:28 by Kenneth Folk. Am I these body sensations, sights, sounds, smells, tastes? Am I the one who knows these sensations, emotions, and thoughts? Am I a disembodied field of awareness? "Nah. Doesn't seem like it." The belief that there is, was, could be, or should be an "I" doesn't get any traction from this point of view. From here, it follows that there is no need to get rid of the "I", in the same way that people who don't believe in demons have no need for exorcism. 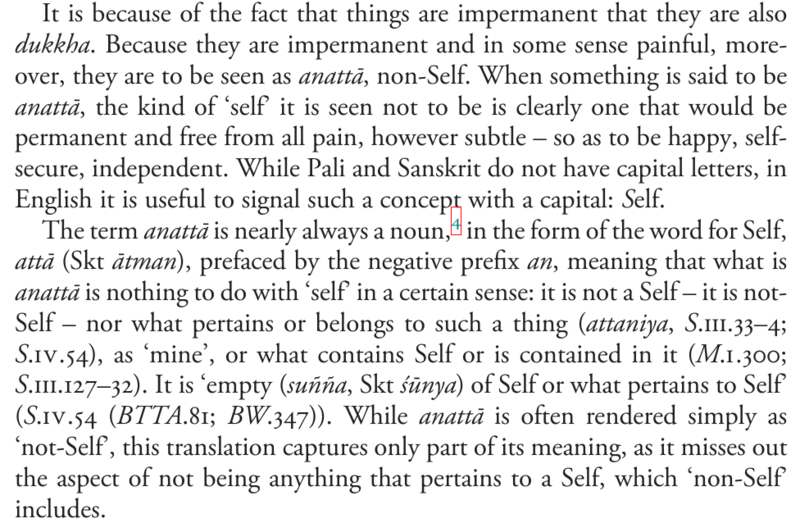 Thus the wonderful odd-ness of what's called not-self, which is not the same as no self, and is not self, either. Yes, no-self as doctrine is arguably counterproductive as it seems to point to a "correct" way to be, in which the sense of self never arises. Not-self, on the other hand, just says that if you look for a self, you won't find one. This is a claim about observable human experience rather than a claim about the nature of the universe or the "right" way to be. If a self is not assumed in the first place, the arising or non-arising of the sense of self is neither good nor bad, it's just something that often happens to the patterns we call humans. I've been musing on this lately, and remembered "First there is a mountain, then no mountain, then there is." We get so excited about the mountain 's disappearing trick that we forget the rest: what does "then there is" amount to? ... what does "then there is" amount to?